Description: New construction! Beautiful custom built ranch home (2016) w/ 1550 sq ft of living space. This split-bedroom home is located in a well-groomed. Peaceful and mature residential development, which is closely restricted. This home provides an attached garage and concrete drive. 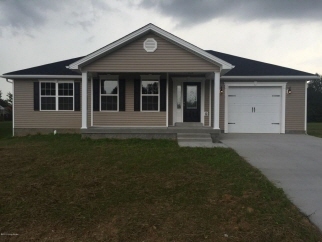 Its open floor plan includes 3 large bedrooms, 2 full baths and a centrally located separate utility room with cabinetry and shelving, the master bath and walk-in closet, as well as the utility room are conveniently accessed from the master bedroom. The home includes hardwood and tile flooring throughout, with carpet in the bedrooms. The front foyer/entry hall gives way to easy access to the kitchen, garage or great room, which features vaulted ceiling and recessed lighting.